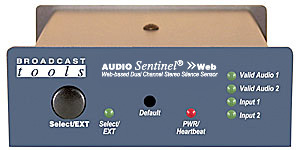 The Audio Sentinel� is a web-enabled two channel stereo silence monitor combined with a transparent, integrated audio switcher. Audio Sentinel� is designed to monitor two balanced or unbalanced independent stereo analog audio sources and switch to a back-up analog audio source when silence is detected on either or both channels. The Audio Sentinel� may also be configured for independent dual-stereo non-switching applications. The Audio Sentinel� can be controlled and monitored locally and/or remotely over any IP network, including private networks, IP-based industrial control networks, and the Internet. Users can operate the product using a web browser or web-enabled mobile device. Email notification may be configured to alert up to EIGHT recipients when alarms are detected. The user may also enable a sound effect to play on their PC speaker when an alarm is generated. Logging of system status, along with the site ID may be emailed in time spans from once an hour to once a day. One SPDT relay is supplied to indicate which input channel is feeding the output, while two additional independent SPDT relays may be configured to perform user defined action sequences. We have also provided SNMP capabilities to allow multiple units to be monitored with any SMNP manager software package. SMTP username and passwords are also supported. The Telco Sentinel is a bi-directional DTMF to ASCII transceiver. It converts DTMF to ASCII and ASCII to DTMF when connected to a telephone line. The unit is also equipped with a electronic hybrid providing send and caller audio on both 3.5mm jacks, along with removable screw terminals. Data interface to a PC is via a USB port. When transmitting DTMF strings, delays between digits can be inserted in 100ms increments. 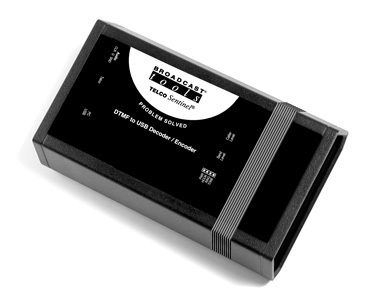 A post-transmit delay of 0.0 to 9.9 seconds can be added that will cause a delayed transmission of tones after the string is received on the USB port. Tones are transmitted at a selectable speed of 50ms, 100ms or 500ms tone/space. Tone transmit buffer is 256 characters long. There is an adjustable ring count for answering the phone line of 1-9 rings or 0 for no answer. Front panel send and caller telephone line audio trimmers are supplied, along with front panel LED�s display; power, ring, hook and tone. The unit derives its power from the USB port. These add COM ports to any computer that doesn't have them (if you need or want a physical COM port to make a connection to an EAS receiver that is near the computer). It is not needed if you are putting an ESS-1 unit on the EAS unit and have LAN/Internet connectivity between the computer and location where the EAS unit is. COMTROL makes high end multi-port serial cards with 4, 8 or 16 ports on a single PCI card. These cards run about $100 per port, so unless you need a high density multi-port solution, we recommend using the USB2COM hang on adapters when needing one to a few ports on the computer (since they are only about $25 in comparison). We carry COMTROL if you need a high density solution. This kit includes a good old fashioned RS-232 mini tester that has LED lights to help you verify that you have data and ground on the right pins for your computer, as well as showing activity when data is coming across. We also include both 25 pin and 9 pin DB connectors, hoods, and a couple 0-25 adapters. Buy this kit for a fraction of what you'd spend at RadioShack. For an additional $50, we will connect to your computer, download the software for you, configure it and train you on its use. You make the cable, we do the rest.